There are millions and millions of connected devices, from smart vehicles to smart meters, generating an increasing amount of data. This worldwide network of connected devices is the Internet of Things (IoT). In a nut-shell, IoT is the name given to technology that enables the connection of both people and machines to the Internet. Proprietary and siloed. They have discrete pairings of devices to enterprise applications and for specific use cases. There are no scalable means to add new use cases or devices. Changes at one end has dependencies at the other. Also, they often have one-way data flow without direct connection into IT data centers. For example, manufacturing systems on the factory floor, which are not connected to the enterprise systems. 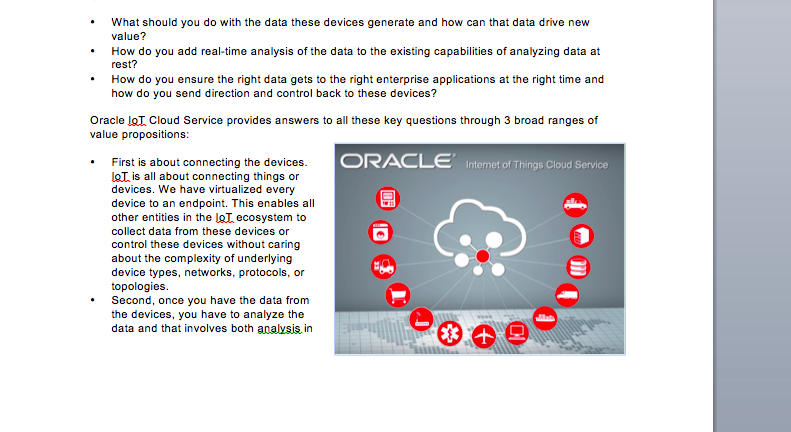 Oracle Internet of Things (IoT) Cloud Service takes care of these limitations by providing a managed Platform as a Service (PaaS) cloud-based offering that can help you make critical business decisions and strategies by allowing you to connect your devices to the cloud, analyze data from those devices in real time, and integrate your data with enterprise applications and various web services. What should you do with the data these devices generate and how can that data drive new value? How do you add real-time analysis of the data to the existing capabilities of analyzing data at rest? How do you ensure the right data gets to the right enterprise applications at the right time and how do you send direction and control back to these devices? First is about connecting the devices. IoT is all about connecting things or devices. We have virtualized every device to an endpoint. This enables all other entities in the IoT ecosystem to collect data from these devices or control these devices without caring about the complexity of underlying device types, networks, protocols, or topologies. Second, once you have the data from the devices, you have to analyze the data and that involves both analysis in real-time as well as the batch analytics. We have built real-time analysis capabilities into the service and also the product can easily integrate with various Analytics cloud services. Third, you want to take the data or composite events that can be created using Oracle IoT Cloud Service to business processes and enterprise applications. This can be enabled through some out-of-the-box integrations or through a growing list of connectors. Also, through these integrations, you can remotely manage these devices by sending control back to devices. There are many use cases for IoT, ranging from the novel–feeding your cat while you are away on business–to the life-critical–such as remote patient monitoring. Each case generates its own value. The two use cases highlighted below are ones Oracle partners could consider for their customers right away. There is a need to understand how a product is performing, to optimize its use and better anticipate issues and failures. Reactive maintenance is critical but is very expensive for both customers and service providers. It also raises issues of customer satisfaction. Active monitoring to drive preventative or even proactive maintenance can help get one ahead. Keeping an asset running and when an issue does happen–minimizing the time and steps required to get the asset back up and running is of great value. Also, this can help product development better understand how the product is performing–where are the issues that can be fixed in the next release, or where are the opportunities to innovate and add new value? The most obvious use here is Track and Trace. Knowing where my shipment (truck, train, container) is and whether my goods will arrive in time and in condition for use or market. Think of frozen goods, milk, ice cream, strawberries, or any perishable item for that matter. It also includes a rapidly emerging segment of usage based models supporting the shift from CAPEX- to OPEX-based models. For example: Car Rental, Usage Based Insurance or Insurance for young drivers, shared ownership schemes and car clubs for private vehicles, tires for commercial vehicles. etc. 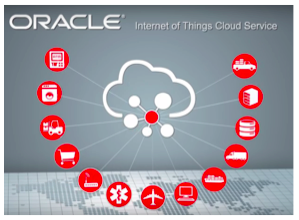 Oracle IoT Cloud Service provides a Platform as a Service (PaaS) cloud-based offering. It helps you collect data from intelligent devices by removing abstract complexity associated with the device connectivity by standardizing integration of devices with the enterprise. It can analyze the data collected from intelligent devices and can reduce the noise and detect business events in real time and enable historical big-data analytics. It makes enterprise processes IoT-friendly to allow enterprise and mobile applications to control devices to make critical business decisions and strategies. Nalin Sardana is Senior Manager, Global Partner Enablement (Cloud Security Services), at Oracle.